The first semi-finalists were decided this morning in the Women’s Singles at the Seamaster 2017 Australian Open, with World Junior Champions dominating the action. In an all China encounter, Wang Manyu defeated Chen Xington 4-0 (11-8,11-4,11-5,11-8) in the first quarterfinal of the Women’s Singles at the Seamaster 2017 Australian Open. It was a perfectly smooth match by Wang, who never looked in trouble. 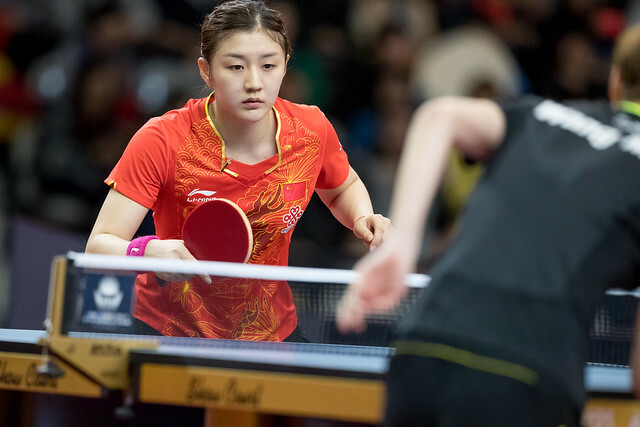 The two time World Junior Champion is now navigating her way in the senior ranks and is using the event as a springboard for this new stage of her career. Wang and Chen will pair up in the doubles final tomorrow. There are no hard feelings between the duo, but Chen says she will be waiting for her interview. Wang’s opponent in the semi-final will be Zhu Yuling (CHN) after she deftly handled Maki Shiomi (JPN), winning in straight games. Shiomi had a chance in the second game, taking the match to 11 a piece, but just couldn’t close it out. The win sets up a clash of World Junior Champions. Both have won the title twice, but Zhu is a couple of steps ahead in her playing career. Could this be a chance for Wang to leapfrog her teammate? Zhu thinks it could be the first of many interesting encounters.